I hold off on buying Halloween Candy because I will eat it. I will eat all of it. I will even try to have DD hide the candy somewhere so I do not eat it. And then I wrangle and wheedle him until he finally gives me the bag of Fun Size Snickers. This year I held off until Trick or Treat night. I meant to go to Target and get 10 bags of candy. It was windy as all get out and pouring rain. We usually get so many kids, I have to sit on the porch to hand out the candy. There is no “going to the door” every time a group comes through. So, I went home and carved my pumpkin. I sketched an interesting stencil of The Green Man. And I got my little tiny pumpkin carving kit and went to work. I worked on it in the Living Room while I heard the first groups of kids traipsing down the street. We were good–the front and side porch lights were off. And we had candles lit for a bit of creepy ambiance. We chuckled as the wind blew, the rain fell and we were inside. No candy to snack on, which was just fine. And no weather to endure. We were snug as bugs in a rug. As soon as Trick or Treat hours were over, I put the Green Man O’Lantern on the porch and lit the candle. It was beautiful. 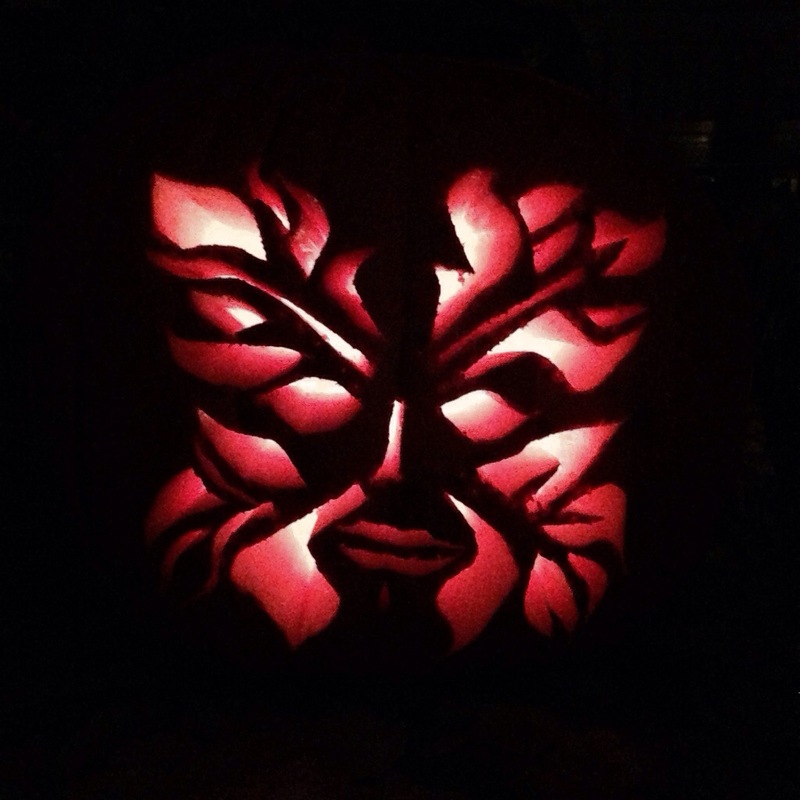 This entry was posted in Design, it turns, Shenanigans and tagged Carving pumpkins, Costumes, creativity, design, give me something good to eat, green man, Jack in the Green, jack o lantern, kids, love, pumpkin, smell my feet, trick or treat. Bookmark the permalink.